They are one of Gibraltar’s most iconic and enduring symbols. Yet a number of the Rock’s famous apes will be captured and relocated abroad in the next few months. Government chiefs have been prompted to act as groups of the Barbary Macaques have been up to no good in built up areas such as schools and Main Street. 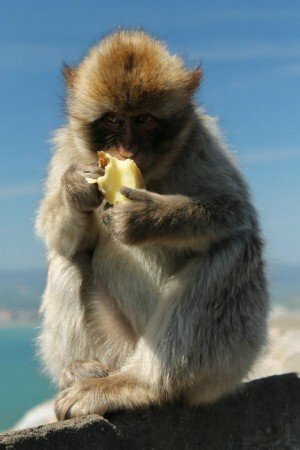 According to scientists based on the British Overseas Territory, many of the monkeys have lost their fear of humans and now regard them as a source of rich food. It’s believed up to 120 of the Rock’s 230 strong monkey colony could now be deported to North Africa. Although officials are remaining tight-lipped as to which country the apes will be heading to, Morocco or Algeria are likely destinations as their current populations are under threat. As part of the plans, more food will be provided in their traditional feeding sites on the Rock, to help draw them away from the centre. By relocating the apes officials won’t have to repeat a cull carried out five years ago, which was ordered after a pack of apes ran riot through Main Street – scavenging from dustbins and breaking into hotel rooms. Former British Prime Minister Sir Winston Churchill famously believed that the Rock would stay British as long as the monkeys remain. In fact, he took this superstition so seriously that during the Second World War extra monkeys were shipped from North Africa to Gibraltar when the population fell to just seven individuals. British soldiers are thought to have first introduced the apes to Gibraltar from Africa during the 18th century. This entry was posted on Sunday, February 9th, 2014 at 12:16 pm	and is filed under Freelance Writing, General Interest, Social Issues. You can follow any responses to this entry through the RSS 2.0 feed. Both comments and pings are currently closed.